You know how sometimes in life you are lucky enough to meet some REALLY great and interesting people? Well, that’s what happened to me the day I met Christine MacPhail. Christine is not only a wonderful person, she has (in my opinion) one of the coolest jobs EVER. No office grind for this lady! 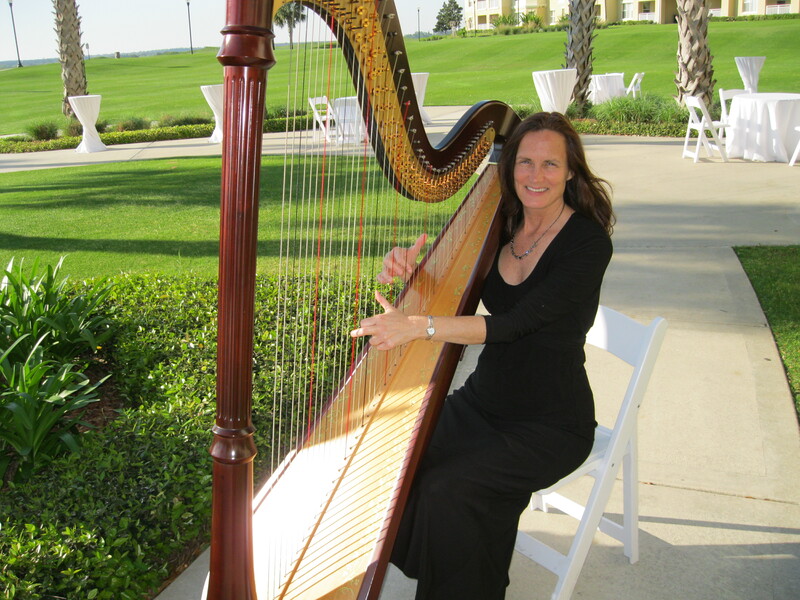 Christine owns her own business and has made her living as a harpist for the past 25 years. One of her favorite places to play is Disney World. 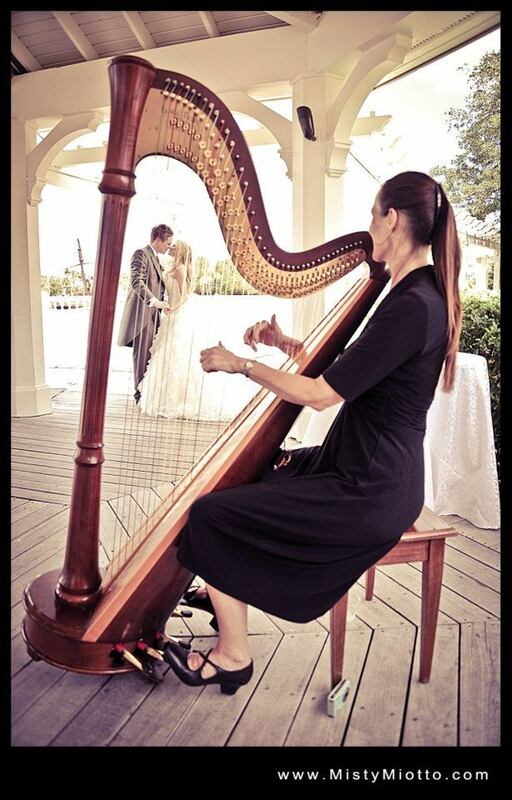 Specifically she has played the harp for Victoria and Albert‘s in the Grand Floridian Resort, and for dozens of Disney weddings all over the property (not to mention the state of Florida). I asked Christine what she loves most about Disney weddings. She was happy to answer, and even threw in some advice for Disney brides. To listen to some of Christine’s Disney music, click here, scroll down mid-page, and choose a song. Here is a great shot of Christine at Disney’s Boardwalk (click to enlarge). You can see the bride and groom through the strings. How does one get into the business of harping? When Christine MacPhail was 6 years old she was in a museum with her family and saw a harp there. Her father ran his fingers along the strings and she was hooked! She started taking lessons and has not stopped since. When she was in college a few friends asked her to play her harp for their wedding ceremonies, and that grew into a business. Fast forward 25 years and Christine is still doing what she loves…and talk about talent?! She can play all sorts of music genres that you might never have imagined coming from a harp. She will amaze you with some of her facebook posts on what she calls “Music Monday” You can like her fanpage on facebook here so you don’t miss a note! ← Making a joyful noise at Disney’s Night of Joy! Oh, WOW… simply BEAUTIFUL!! THANK YOU for the links to the music–I LOVED hearing “A Whole New World” on the harp… consider me a new fan, Christine :). And thanks for the awesome post, Krista! Thank you so much Krista for the wonderful post, and also to Wendy for the really nice comment! !